The following expansion scenarios were created for the Buffy the Vampire Slayer board game from Hasbro/Milton Bradley. We have no connection to the Buffy TV show or the board game. We are simply fans that love both the show and game, who had, at one point in our lives, enough spare time on our hands to devise some new scenarios after we played the four original scenarios to death. We're offering these expansion scenarios to the public domain so the rest of the world can hopefully have as much fun with them as we did. Evil Set-Up: Place the Master, Darla and Bad Faith on their START spaces. Place Angelus on the Hellmouth. Artifacts: Use the Mark of the Anointed and three non-story Artifact cards. Evil Objective: Destroy or sire all of the Good characters. Good Objective: Destroy or restore the soul of all of the Evil characters. Angel/Angelus starts out as an Evil character. Every time the moon phase marker lands on or crosses over the first New Moon position (whether by a roll of the blue movement dice or as the result of a spell), Angel/Angelus switches sides from Evil to Good, or vice versa. When Angel/Angelus switches sides, his health points are restored to their maximum level of 12, and he loses his Artifact card, if he his holding one. The player who newly controls Angel/Angelus decides which corner to place the discarded Artifact. Angel/Angelus moves every turn, and always moves immediately after Buffy's turn, before any of the other Evil characters take their turns (regardless of whether he is controlled by Good or Evil), and before the black Evil die is rolled. Angel/Angelus is always invited into the blue invite-only zones, whether he is Good or Evil. If Angel/Angelus is killed, and then summoned again by Evil as an Evil servant, the resurrected Angel/Angelus continues to switch sides on each New Moon as before. Evil Set-Up: Place Adam on his START space, Angelus on Mr. Trick's START space, Kathy on Vamp X's START space, and Veruka on Spike's START space. Artifacts: None of the Special Artifacts are used. Use four non-story Artifact cards. Do not use the Moon Stone Artifact. Evil Objective: Assemble the Chain of Chaos by placing three Evil characters in adjacent spaces, each of whom hold an Artifact. Good Objective: Destroy or restore the soul of all of the Evil characters, or destroy any two of the four Artifacts. Any three of the Artifacts can comprise the Chain of Chaos for Evil when assembled. Each Evil character which makes up the Chain of Chaos must be adjacent to another Evil character horizontally or vertically, but not diagonally. All special powers described on the Artifact cards are still valid during this game scenario. Place Willow in the black Villain stand on Willow's START space. Willow is Evil in this game. Willow uses her own health meter and starts with 5 health points. Warren is disguised as Bad Faith this game, and uses Bad Faith's playing piece (or use the Warren playing piece above). Place Warren on Bad Faith's START space. Warren uses the red servant's health meter and starts with 5 health points. Andrew is disguised as Vamp X in this game, and uses Vamp X's playing piece (or use the Andrew playing piece above). Place Andrew on Vamp X's START space. Andrew uses the blue servant's health meter and starts with 7 health points. Jonathan is disguised as Mr. Trick in this game, and uses Mr. Trick's playing piece (or use the Jonathan playing piece above). Place Jonathan on Mr. Trick's START space. Jonathan uses the green servant's health meter and starts with 7 health points. Place Buffy and Xander on their START spaces. Place Spike in Willow's pink stand on Spike's START space. Spike starts out Good in this game, with 8 initial health points. In her rage, one of Willow's spells went awry and temporarily changed Dawn's appearance to resemble Oz (something to do with her being The Key... it's all terribly complicated, you see). Thus, Oz's playing piece is considered to be Dawn in this game. Place Dawn on the blue Help space in the Summers' House. Dawn uses Oz's health meter and starts with 6 health points. Artifacts: Use the Book of Spells and three other non-story Artifact cards. Good Objective: Protect the Evil Trio and Willow from harm (even though they will be attacking Good whenever possible), while attempting to convert Willow back to Good. If Willow is converted back to Good, Good wins. If Willow, or any two of the Evil Trio die, then Good loses. The so-called Evil Trio (Warren, Andrew and Jonathan) have just killed Tara, unwittingly unleashing the evil witch powers within Willow. In order to escape Evil Willow's vengeance, the Evil Trio disguise themselves (Warren as Bad Faith, Andrew as Vamp X and Jonathan as Mr. Trick). Willow's fury at Tara's death makes her blind to the fact that her servants are, in fact, the very three guys she is after in the first place, although the Good players immediately see through the Evil Trio's flimsy disguises. At the beginning of Evil's turn, Evil Willow rolls three Majik dice. If all three dice are successful Majik rolls, Willow summons fireballs through the air and, if any of the Evil Trio are outdoors when this happens, the affected character(s) sustain three points of damage. Evil Willow does not move on turns when this happens, and when this occurs the black Evil die is not rolled either (the three servants get to move instead). When casting spells and attempting to retrieve Artifacts, Evil servants roll their own Majik dice, not Evil Willow's 3 Majik dice. When an Evil Trio servant character rolls an unsuccessful Majik die, the spell they are attempting backfires and that character loses 1 health point for each unsuccessful Majik die. If a Good player attacks one of the Evil Trio characters, it is assumed that they are simply teaching them a valuable life lesson and, thus, for each point of damage that would normally be taken in an attack, the Evil Trio character being attacked actually gains a health point. The Evil Trio's health points cannot rise above their maximum health levels (5 for Warren, 7 for Jonathan and Andrew). The Tara Help card is not used for the purpose described on the card, but is instead used to convert Willow back to Good. To convert Willow back to Good, a player holding the Tara card must be adjacent to Willow and roll at least 3 successful Majik dice. Since Xander has a special bond with Willow, he rolls 5 extra Majik dice when he attempts to convert Willow back to Good using the Tara Help card. 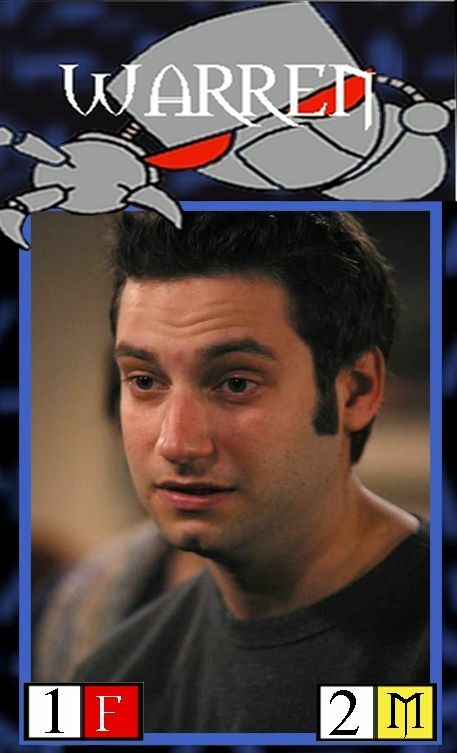 The Jonathan Levinson Help card cannot be played while Jonathan is in the game. Although they are disguised as vampires, Andrew and Jonathan do not have vampire powers and do not have to move indoors upon sunrise. All Evil Trio characters roll 1 fight die by default, and 2 Majik dice by default. Dawn is not a werewolf. Dawn rolls 2 fight dice and 2 Majik dice by default, and uses Oz's card tray. Dawn is wounded at 4 health points or below. Spike uses Willow's card tray and retains his normal fight/Majik dice. Spike is still a vampire and is affected by sunrise. Spike cannot be sired to be made Evil again. Spike is invited to all indoor areas. Spike loses 1 health point if he draws a Garlic Research card, and must discard it immediately. Place the Master in the black stand on his START space and set his maximum health level to 20. Place the Judge in the blue stand on his START space and set his maximum health level to 9. Place the Ascended Mayor in the green stand on his START space and set his maximum health level to 12. Place Adam in the red stand on his START space and set his maximum health level to 13. Artifacts: None of the Special Artifacts are used. Use four non-story Artifact cards. Good Objective: Destroy all of the Evil characters. Evil always rolls the black die to determine how many Villains to move on that turn, based on the total number of pips rolled (2 or 3). The total damage done by Good characters is doubled. Evil can only obtain Artifact cards during a Full Moon. Evil Set-Up: Place Spike and Vamp X on their START spaces. Place Harmony on the Hellmouth. No main Villain piece is used at the beginning of the game. Artifacts: All four Special Artifacts are used (Mark of the Anointed, The Judge's Arm, Box of Garvok and Power Chip). Good Objective: Destroy or restore the soul of all Evil characters. None of the powers described on the Artifacts are valid for this game. However, if no main Villain is currently on the board (Adam, The Master, The Major or The Judge), any evil servant can summon the Villain described on the Artifact card by landing on that Villain's START space and rolling at least 1 successful Majik die. The Villain would then appear on the Hellmouth but cannot fight, move or play cards until Evil's next turn. After a main Villain is summoned using an Artifact card, the Artifact card is discarded for the rest of the game. If a Majik die roll to summon a Villain is not successful, then the Artifact card is placed in an available corner of the board according to a special die roll by the Evil player using the blue die: 1 = Museum, 2 = The Initiative, 3 = Buried Church and 4 = Loading Docks. If the corner signified by the die roll already has an Artifact card, roll again until an available corner is determined. Evil does not need to roll the black Evil die if no Villain is on the board. Evil Set-Up: The First Evil has no corporeal form and thus does not use any playing pieces. The First Evil uses the Villain's black health meter and starts with 20 health points. Place Xander, Willow and Buffy on their START spaces. Use Oz's playing piece as Dawn (or use the Dawn playing piece above) and place Dawn on the blue Help space in the Summers' House. Dawn uses Oz's health meter and starts with 6 health points. Place Spike on his START space using the red stand. Spike is Good and uses the red health meter. Spike starts with his normal amount of health points. Use Vamp X's playing piece as Anya (or use the Anya playing piece above) in the blue stand and place Anya on the Weapon space in the Harris' House. Anya is Good and uses the blue health meter. Anya starts with 6 health points. Place Faith's playing piece in the green stand on her START space. Faith is Good and uses the green health meter. Faith starts with 12 health points. Artifacts: Use the Majik Sword and three other non-story Artifact cards. Evil Objective: Unleash hell on Earth by destroying or siring any four of the Good characters. Good Objective: Bring the First Evil's health points down to zero. At the beginning of Evil's turn, Evil rolls the black Evil die to determine how many Good characters to possess that turn (2 or 3). The First Evil chooses which Good characters to possess and on that turn rolls their movement dice, attacks for them, etc. The First Evil can draw Help, Research and Weapon cards when possessing a Good character, and can play any cards in that player's hand, but only if playing the card(s) has a practical purpose. For example, the First Evil cannot discard or play a card that adds Majik dice if no Majik dice are actually rolled. When possessing a Good character, the First Evil can only trade cards with another Good player that has also been possessed on that turn. When possessing a Good character, the First Evil can draw Evil cards and conceal them from the non-possessed Good players. The First Evil can only summon Evil servants if no other character (Good or Evil) is currently on the board using the corresponding color playing stand. On Good's turn, the effects of the First Evil's possession are still in effect, so Good can attack the players possessed in the previous turn. Doing so inflicts points of damage against the First Evil, not against the Good character. Good characters that were possessed by Evil during Evil's turn cannot move or play cards during Good's turn. Anya is not a vampire. Anya, Spike, Faith and Dawn can each hold the equivalent amount of cards as Oz's tray can hold: 1 Weapon card, 1 Help card, 1 Research card and 1 Artifact card. The Majik Sword Artifact is, in fact, the sword used by the First Slayer, and adds three extra points of damage during attacking. The Anya Help card cannot be played if Anya is currently on the board. The Faith Help card cannot be played if Faith is currently on the board. Good wins if Spike plays the Spell of Evil Summoning and sacrifices himself by rolling three successful Majik dice while standing in any space adjacent to the Hellmouth. 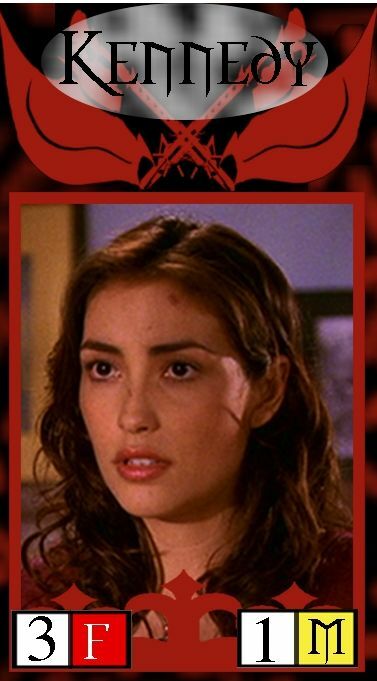 Good wins if all the female Help cards (Tara, Faith, Joyce Summers, Cordelia Chase, Amy Madison, Kendra, Jenny Calendar and Anya) are held by Good players at the same time, empowering them all with the Slayer power that Buffy and Faith once held all to themselves. Evil Set-Up: Place Adam and Vamp X on their START spaces. Place Veruka on Spike's START space. Place Angelus on the Hellmouth. Artifacts: Use the Power Chip and three non-story Artifact cards. Good Objective: Destroy or restore the soul of all the Evil characters. Any spells on a Research card, or any "Sire a Vampire" Evil cards, can be used for the original purposes described on their respective cards, OR they can be used as special Forcefield spells. To cast a Forcefield spell, a player must be in an indoor area with an enemy player (or players) in the same indoor area, and roll at least two successful Majik dice. Both Good and Evil characters can cast Forcefield spells. When a Forcefield spell is cast on an enemy, the enemy characters cannot leave that indoor area until the next sunrise. The Buried Church and the Mausoleum are two separate indoor areas. The two steps leading down to the Mausoleum are part of the Mausoleum. The Lowell House and the Initiative are two separate indoor areas. The elevator is part of the Initiative. Sunnydale High School and the Library are two separate indoor areas. The spaces to the right of the Hellmouth are part of the Library. Players cannot be trapped in a Forcefield area by their own spells. However, multiple players can cast Forcefield spells in the same area at the same time. Evil Set-Up: Place Adam on his START space. Place Kathy on Darla's START space. Place Harmony on Drusilla's START space. Place Veruka on the Hellmouth. If a werewolf rolls two fangs during an attack, the character being attacked is bitten and from that point on, that character becomes a werewolf during the Full Moon. Just as werewolves cannot become vampires, vampires cannot become werewolves. Adam can become a werewolf. When a character other than Oz or Veruka is a werewolf during a Full Moon, that character cannot hold any cards, and that character cannot roll any Majik dice. A non-Oz, non-Veruka werewolf character's fight dice are doubled during a Full Moon, as are his/her/its movement rolls. A non-Oz, non-Veruka werewolf character's health points rise to their maximum level when the Full Moon first hits. Bitten characters reposition their marker cards upside-down in their stands to signify that they are now werewolves. Use the Mayor's playing piece as Ben (or use the Ben playing piece above) and place Ben on the Judge's START space. Ben uses the main Villain's health meter and starts with 7 health points. Place Darla, Drusilla and Bad Faith on their START spaces. Artifacts: Use the Box of Garvok as the Power of the Key, and three non-story Artifact cards. Evil Objective: Destroy or sire Dawn to break the barrier between dimensions and unleash Hell on Earth. If an Evil servant carrying the Power of the Key (a.k.a. the Box of Garvok) Artifact card becomes adjacent to Ben, switch the Mayor's playing piece with the Demon Mayor's, and use the Demon Mayor's playing piece as Glory (or use the Glory playing piece above). Glory's health points then automatically rise to 20. 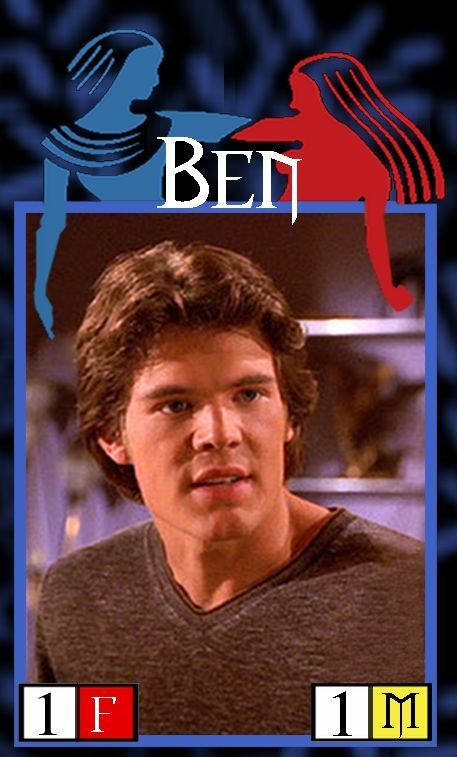 Ben cannot be killed until he has transformed into Glory. Dawn cannot be killed until Ben has transformed into Glory. Ben rolls 2 fight dice and 2 Majik dice by default. Glory rolls 5 fight dice and 3 Majik dice by default. If Glory is on the board, and Dawn is down to exactly 1 health point, Good can alternatively win the game if Buffy sacrifices herself out of love for her sister Dawn, by throwing herself off the roof of the Factory (by rolling 2 successful Majik dice while on an exit space inside the Factory). Evil Set-Up: Place Adam, the Vampire Xander, the Vampire Willow and the Vampire Buffy on their START spaces. All of these characters start out Evil, and use the black health markers. Good Set-Up: Place Oz, Darla, and Spike on their START spaces. Place Angel on Mr. Trick's START space. All of these characters start out Good, and use the white health markers. Artifacts: Use the Power Chip, the Gem of Amarra, and two other non-story Artifact cards. Evil Objective: Destroy all of the Good characters. All vampires can have their souls restored using the Spell of Soul Restoration. Spike, Darla and Angel have already had their souls restored and are working for Good, at the start of the game. Buffy, Willow and Xander have tragically been sired and are Evil vampire servants at the start of the game. Their card trays are turned over and they cannot hold Help, Research or Weapon cards (but they can draw Evil cards). The Fight and Majik dice stats on the vampire side of Evil servants' trays are used. Evil servants' Artifact cards can be placed face-down so Good players cannot see. 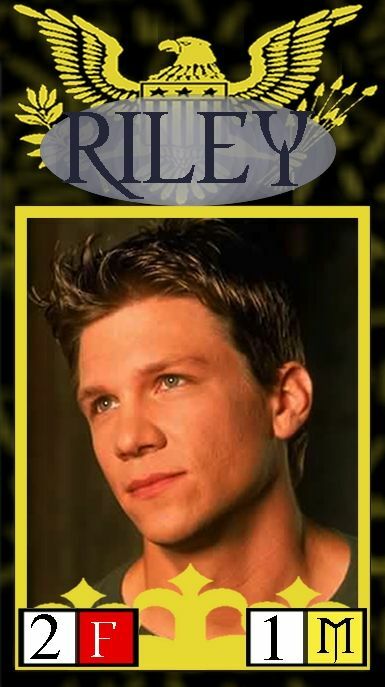 Evil still rolls the black Evil die, and considers all non-main-Villain Evil players as servants, and does not move Xander, Willow and Buffy separately at the beginning of Evil's turn. Evil does not have to move Xander, Willow and Buffy in their normal turn order. Good takes turns in the following order: Oz, red-stand character, blue-stand character then green-stand character. The Good character in the green stand can hold up to two Research cards and one Artifact, but no other cards. The Good character in the blue stand can hold up to two Help cards and one Artifact, but no other cards. The Good character in the red stand can hold up to two Weapon cards and one Artifact, but no other cards. Vampires that have their souls restored cannot draw Evil cards, and have to show their cards face up, but are still affected by sunrise. Xander, Willow and Buffy are always invited into the special blue indoor areas. Evil can only summon reinforcements if a character with the same-colored stand is not already on the board. Evil Set-Up: Place the Master, Spike, Drusilla and Vamp X on their START spaces. Good Objective: Destroy the Master. As a result of one of Ethan Rayne's mischievous spells, the Good characters have become their Halloween costumes, and stay this way for the entire game. Buffy is a Victorian high-society woman and has only 1 fight die by default. Willow is a ghost who cannot hold any cards for longer than one turn (except for Artifacts), but she can walk though walls. Xander is a soldier with 3 fight dice by default, all 4 of his non-artifact cards that he can hold must be Weapon cards (his starting card is also a Weapon card instead of a Help card). Xander can play multiple Weapon cards during an attack. Oz is a werewolf for the entire game, and does not gain or lose health points at the turn of the full moon as usual. Evil Set-Up: Place the Mayor, Vamp X and Bad Faith on their START spaces. Place Harmony on the Hellmouth. Artifacts: Use the Box of Garvok and three non-story Artifact cards. Evil Objective: Condemn all of the Good characters to a life incarcerated in a mental asylum by destroying all of the Good personalities. Good Objective: Reverse the medication's enchantment and escape the asylum by destroying or restoring the souls of all of the Evil personalities. After Buffy tells her mother that she is a vampire slayer, Joyce Summers comes to the conclusion that Buffy, Willow, Xander and Oz all have serious mental problems, and she convinces all of their parents to commit the Scooby Gang to a mental asylum. As a result of an overzealous pharmaceutical demon who freelances at the asylum, the gang is forcibly medicated. Buffy, Willow, Xander and Oz all develop split personalities and battle their alter egos in an imaginary version of Sunnydale that only exists within their collective imaginations. Whenever Buffy takes a point of damage, so does her alter ego Bad Faith. Whenever Willow takes a point of damage, her other personality Harmony also loses a point. Whenever Xander takes a point of damage, his evil twin Vamp X also sustains a point of damage. Whenever Oz takes a point of damage, so does the Mayor. The alter egos do not gain health points when their alternate personalities do (and the Mayor does not lose points when Oz returns to human form and descends to 6 health points again). Dusting a vampire does not kill that vampire's alter ego. Siring or restoring the soul of a vampire does not affect the health points of that character's alter ego. Evil characters that are summoned are considered figments of the gang's collective imagination and, as such, do not have alter egos. The Mayor can be killed even if he has not ascended. Place the Judge and Spike on their START spaces. Place Kathy on Vamp X's START space. Place Harmony on Drusilla's START space. Masking tape is placed horizontally and vertically next to the board, with letters A through Q labeled horizontally and numbers 1 through 17 labeled vertically. Under this labeling scheme, square A-1 is the Artifact corner in the Loading Docks, P-1 is the Artifact corner in the Museum, P-17 is the Artifact corner in the Initiative, and A-17 is the Artifact corner in the Buried Church. Artifacts: Use the Military Costume and three other non-story Artifact cards. Evil Objective: Destroy or sire Willow. 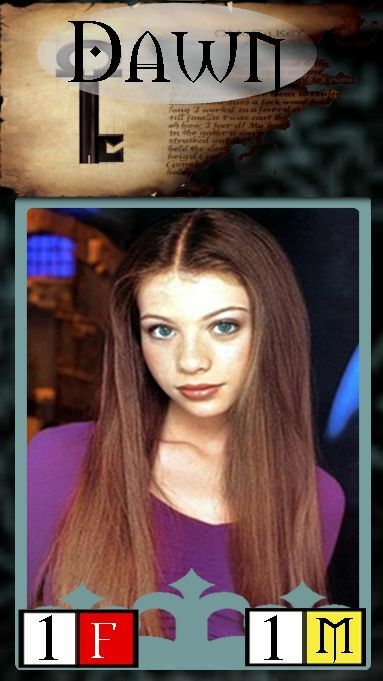 Willow's invisibility spell experiment has gone horribly wrong after Harmony attacked her while Willow was casting it, making them both invisible and propelling them to opposite sides of Sunnydale. Harmony and Willow are only visible during the New Moon. The players controlling Harmony and Willow must write down the position of their characters during each move, covering the location to keep it secret when the game is not currently in a New Moon phase. Recorded next to their locations, always visible, is the die roll that character rolled that turn (regardless of how many spaces the character actually moved). Whenever a character is visible, the opposing player may choose to audit the character's positions and movements. Any cheating that is uncovered results in the offending player automatically forfeiting the game. Invisible characters can still draw cards, play cards and attack as normal, although doing so may give hints as to where that character is. Players cannot occupy the same space as invisible characters, nor can opposing players move through invisible characters' positions. It is the invisible player's responsibility to announce when another player's movement would conflict with the rules relating to his/her/its current position, or for updating health stats when afflicted by sunlight. When the Military Costume Artifact is used, the opposing invisible player must reveal her current position until that character rolls the blue Movement dice again. Upon use, the Military Costume Artifact card is placed in an available corner of the opposing invisible player's choosing. Place the Master, Darla and Drusilla on their START spaces. Place Veruka on the Hellmouth. Some cards become bombs. Before the game begins, the Evil player chooses and writes down the name of an Evil card that will be used as a bomb. Evil leaves the Evil bomb card name face-down so Good cannot see. Place Buffy, Willow, Xander and Oz on their START spaces. Some cards become bombs. Before the game begins, the player controlling Buffy chooses and writes down the name of a Weapon card that will be used as a bomb. The player controlling Willow chooses and writes down the name of a Research card that will be used as a bomb. The player controlling Xander chooses and writes down the name of a Help card that will be used as a bomb. The player controlling Oz chooses and writes down the name of a valid Artifact card that will be used as a bomb, and then includes this card as one of the four Artifact cards to be shuffled into the game. The player controlling Oz displays the name of the special Artifact card bomb face-up so everybody (Good and Evil) can see. 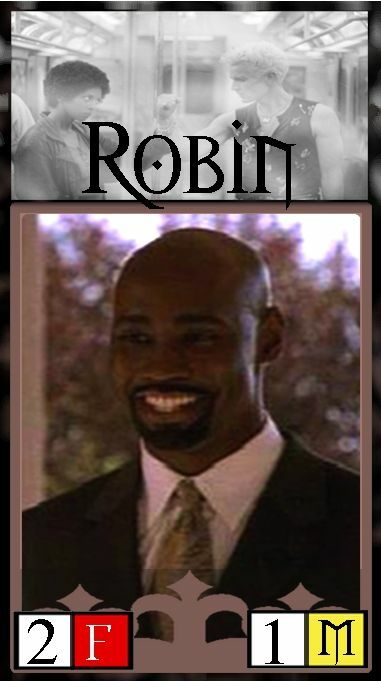 The Good player(s) controlling Buffy, Willow and Xander and Oz secretly share the names of the Weapon, Research and Help bomb cards, but leave them face-down so Evil cannot see. The cards used as bombs cannot be used for the original purposes described on the cards. If any player lands on or passes through a card-draw space that is the same color as a bomb card held in anybody's hands, that character detonates a bomb. For example, if Buffy has the Weapon card bomb and another player passes over a red space, the bomb detonates. It is not announced that a character is potentially passing through or on a bomb until after that character plays or draws a card, fights or announces that his/her/its turn has ended, at which point the character who chose that bomb card flips over the piece of paper showing that bomb card's name. If there is any table-talk in which one player tries to warn another that they would be passing through or landing on a bomb, the offending table-talker is also affected by the bomb detonation. When a bomb is detonated, the character who detonated it (by passing through or landing on it) rolls the number of Majik dice that he/she/it currently has in health points. For every positive Majik roll, that character loses one health point. After a bomb is detonated, its bomb card is discarded. Vampires that pass through active bomb spaces when running indoors from sunlight detonate bombs. All characters can detonate any type of bomb, regardless of if they are Good or Evil. It is valid (and perhaps even desirable) to choose cards that are not unique as bomb cards. For example, Evil can use all "Sire a Vampire" cards as bomb cards, but then Evil cannot use these cards to sire vampires for the course of the game. A player who obtains a bomb card does not detonate the bomb on that turn, and does not detonate the bomb just by starting on the bomb space on the next turn. The bomb is not armed until after the player who draws the card moves off that space. However, if that character is still sitting on the bomb space when another character detonates the bomb, then all characters resting on that type of bomb space are affected by the bomb's detonation. Evil Set-Up: Place the Mayor, Bad Faith, Mr. Trick and Vamp X on their START spaces. Any dead character can be resurrected when another character is adjacent to that player's START space and performs a Lazarus spell by rolling two successful Majik dice. No cards are needed for Lazarus spells. Only Good characters can resurrect Good characters, and only Evil characters can resurrect Evil characters. Evil can still summon Angelus, Harmony, Veruka and Kathy the normal way, using the summoning spells on the appropriate Evil cards. Evil characters cannot be resurrected if another character already exists with that color stand. The Mayor can be killed even in his non-ascended form. If the Mayor is resurrected, he returns in non-ascended form. Evil Set-Up: Place the Judge, Spike and Vamp X on their START spaces. Place Angelus on the Hellmouth. Artifacts: Use the Judge's Arm, the Military Costume and two other non-story Artifact cards. Good Objective: Destroy all Evil characters. Xander's destiny is revealed in a prophecy: he will one day unleash the Light of the Loyal and rid Sunnydale of Evil once and for all. Xander cannot take any points of damage until Oz, Willow and Buffy are all dead. The last remaining Evil character cannot be killed (although he/she/it can be brought down to just one health point) until Xander unleashes the Light of the Loyal. Xander unleashes the Light of the Loyal by holding onto the following five cards at the same time: Anya, Rupert Giles, Rocket Launcher, Spell of Evil Summoning and the Military Costume. Once the Light of the Loyal is unleashed, all Evil characters are instantly destroyed and the game is over. Place the Master on his START space, with his partner Darla next to him on the adjacent Artifact space. Place Drusilla on her START space, with her partner Spike on the adjacent space above her. Place Oz on his START space, with his partner Willow next to him on the adjacent blue Help space. Place Xander on his START space, with his partner Buffy next to him on the adjacent red Weapon space. Artifacts: Use the Mark of the Anointed, the Moon Stone and two other non-story Artifact cards. Evil Objective: Destroy or sire Buffy. One of Giles'spells has gone horribly awry, and as a result all characters have been fused with the character next to them as Siamese Twins. A character's partner must move with her/him whenever that character moves. A character's partner cannot attack, play or draw cards unless it is the partner's turn. A character cannot move into a space that would result in an unavailable adjacent space for her/his partner. When a character is killed or sired, that character is detached from her/his partner and can then move on her/his own. When characters are paired, they can swap places, which counts as one movement. Do not follow the instructions on the Moon Stone card, but instead the Moon Stone Artifact card is used to detach from a partner. When the Moon Stone card is in a player's hand, that player can declare that she/he is attempting a Separation spell. If the player then rolls two successful Majik dice, then she/he becomes separated from her/his partner. If a Separation spell is attempted but failed, the player may keep the card and try again on another turn. Once a Separation spell has been successfully performed, the player who performed the spell cannot discard or transfer the Moon Stone card to another player, until that character's death, at which point the Artifact card is placed in an available corner and can then be used by another player who obtains it. Evil Set-Up: Place Adam, Darla and Drusilla on their START spaces. Place Veruka on the Hellmouth. Evil Objective: Destroy the character who holds the Power Chip. Only the character who holds the Power Chip card can inflict points of damage against Adam. Only Good characters can capture and hold Artifact cards. Once a character takes an Artifact card, that character cannot trade or give up this Artifact card, with the exception of Oz, who can only get rid of an Artifact card when he turns into a werewolf. Artifact cards cannot be destroyed, even by the Living Flame Research cards. If an Artifact card is a one-use-only card, then it is no longer valid after the first use, but the character holding it still retains this Artifact card for the rest of the game. Place the Demon Mayor, Bad Faith and Mr. Trick on their START spaces. Place Kathy on the Hellmouth. The Demon Mayor starts with 17 health points. Evil Objective: Kill or sire Buffy. Obtain all four of the Artifact cards and bring them to the Mayor's Office to make Buffy mortal. Good Objective: Kill the Demon Mayor. Obtain six special Scavenger Hunt cards and bring them to the Factory to make the Demon Mayor mortal: 2 Research cards (The Living Flame cards), 2 Weapon cards (Kendra's Lucky Wooden Stake and the Rocket Launcher) and 2 Help cards (Anya and Larry). The Demon Mayor cannot be killed until all six of the special Scavenger Hunt cards (listed above under "Good Objective") are collected by Good characters (before this happens, the minimum health point level the Demon Mayor can have is 1) and brought inside the Factory. Buffy cannot be killed or sired until all four of the Artifact cards are collected by Evil (before this happens, the minimum health point level Buffy can have is 1) and brought inside the Mayor's Office. The Living Flame Research cards cannot destroy Artifacts. Once any Scavenger Hunt card is brought inside the Factory, it leaves the Good player's hand and is placed in a special pile off the board, next to the Factory. Once any Artifact card is brought inside the Mayor's Office, it leaves Evil's hand and is placed in a special pile off the board, next to the Mayor's Office. Buffy cannot take or hold any Artifact cards. Evil Set-Up: Place the Judge, Bad Faith, Mr. Trick and Darla on their START spaces. Evil Objective: Destroy or turn all of the Good characters. Good Objective: Destroy or turn all of the Evil characters. If a character rolls a 1 with a moon on it during the movement roll, that character becomes Good on the next turn. If a character rolls a 6 with a moon on it during the movement roll, that character becomes Evil on the next turn. When a character switches sides, he/she does not move, draw or play cards, or fight until the next turn. Characters do not lose cards when switching sides. Oz, Xander, Willow and Buffy can still draw and play Research, Help and Weapon cards, even when they are serving Evil (unless they are vampires), but can never draw Evil cards, and can never trade cards with Good players when they are Evil. Characters who started the game as Evil keep the cards that currently apply to them, but can never draw Research, Help or Weapon cards, and cannot trade cards with Evil players when they are Good. Characters who started the game as Evil hold their own cards, and can hold up to four Evil cards at once. Good vampires are still affected by sunlight. When a character switches sides through a moon roll, their health points do not rise to their maximum levels (when a Good character is sired, however, the standard rules still apply). If a character rolls double moons, he/she is instantly killed. "A Tale of Two Slayers"
Evil Set-Up: Place Bad Faith on her START space. No other Evil characters are on the board at the beginning of the game. Good Set-Up: Place Buffy on her START space. No other Good characters are on the board at the beginning of the game. Good Objective: Destroy Bad Faith. Buffy does not sustain any points of damage unless there are two or more Evil characters on the board. Bad Faith does not sustain any points of damage unless there are two or more Good characters on the board. Good and Evil players can summon other characters for their team by landing on the START space of the character to be summoned, and rolling at least one successful Majik die for all Good characters and Evil servants, or by rolling two successful Majik dice to summon main Villains (the Master, the Judge, the Mayor and Adam). Any character can be summoned as either Good or Evil. Evil only rolls the black Evil die if there is a main Villain on the board. There are no restrictions on which characters the Evil player has to move before other Evil servants. No red-stand characters can be on the board except for Bad Faith. No green-stand characters can be summoned if there is already a character in a green stand on the board. No blue-stand characters can be summoned if there is already a character in a blue stand on the board. No main Villains can be summoned if there is already a main Villain character in a black stand on the board. Newly summoned characters appear on the START space of the character that summoned them, and thus cannot be summoned if another character currently occupies that space, or if they are vampires and doing so would summon them into sunlight. 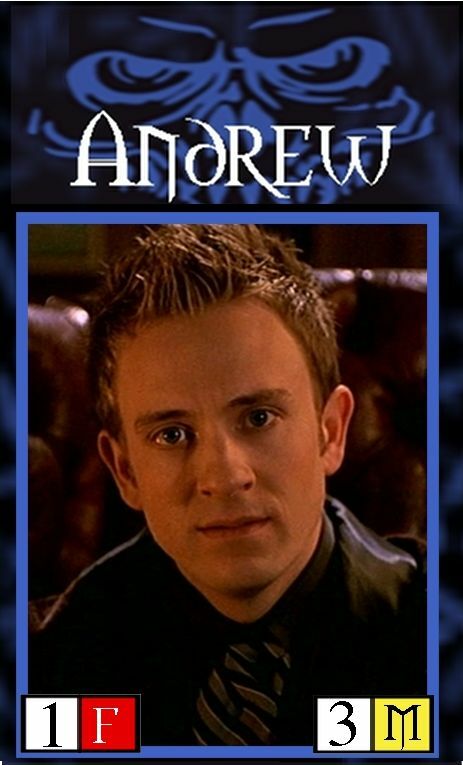 If Angel/Angelus, Harmony or Kathy summons a character, the newly summoned character appears on the Hellmouth (since those characters do not have START spaces) if they are Evil, or if they are Good they appear on the blue Help space behind Sunnydale High School. A newly summoned Good character cannot take a turn until Evil takes a turn. Likewise, a newly summoned Evil character cannot take a turn until Good takes a turn. If the Mayor is summoned, he is summoned in his ascended Demon Mayor state. Previously killed characters can return to the game if they are summoned again. Alternate Scenario: A variation of this game called "A Tale of Two Werewolves" can be played by substituting Oz and Veruka's roles for Buffy and Bad Faith. Evil Set-Up: Place the Master on the sewer grating closest to Giles' Apartment. His health level starts at 5. No other Evil characters are on the board at the beginning of the game. The Master does not start with any cards. Good Set-Up: Place Buffy on the space adjacent to the Master just outside Giles' Apartment that is between the Evil and Weapon card spaces. Her health level starts at 1. No other Good characters are on the board at the beginning of the game. Buffy does not start with any cards. Artifacts: Use the Mark of the Anointed and three non-story Artifact cards. However, set them aside at the beginning of the game without placing them in the corners of the board. It's been a bloody battle. Spike, Drusilla and Darla have been dusted. Oz, Willow and Xander have been killed. And Buffy is on the verge of destruction in a fight-to-the-death match with the Master, right outside Giles' Apartment. 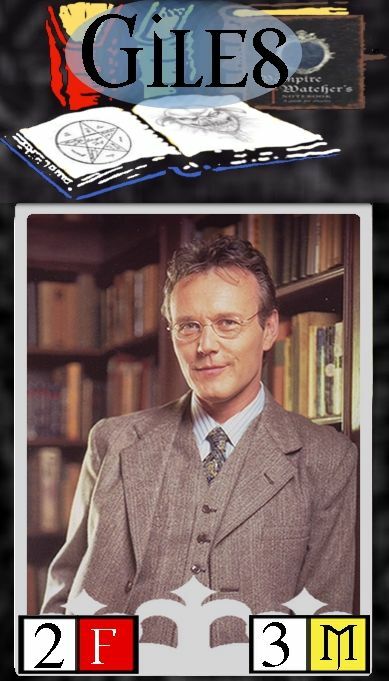 But just before the Master can deliver the final death blow, Giles frantically casts an obscure time-travel spell at the last moment that forces all the characters to play in reverse time. The moon phase counter moves counter-clockwise. The turn order of all characters is reversed from what it would normally be. Buffy moves first, before Evil. Whenever the moon phase lands on or passes by a non-sunrise, non-full-moon, non-new-moon space, one health point is added to all Good characters if a Good character rolls the moon(s), or one health point is added to all Evil characters if a Evil character rolls the moon(s), up to the character's maximum number of health points. Any Good character that is not on the board (at zero health points) when the moon phase lands on or passes by a non-sunrise, non-full-moon, non-new-moon space, is resurrected with 1 health point on his/her START space. Evil characters are also resurrected when the moon phase lands on or passes by a non-sunrise, non-full-moon, non-new-moon space. Evil servants are resurrected with 1 health point on their START spaces. 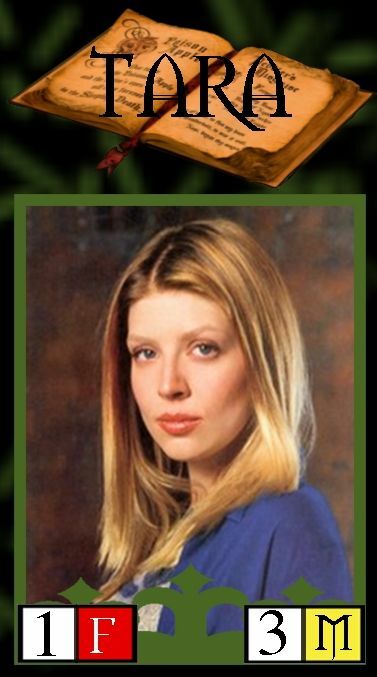 When Evil characters are resurrected, if no green-stand servants are on the board, Drusilla is resurrected. When Evil characters are resurrected, if no blue-stand servants are on the board, Darla is resurrected. When Evil characters are resurrected, if no red-stand servants are on the board, Spike is resurrected. There is no limit to the number of times a character can be resurrected (although if Buffy or the Master die, the game is over). Whoever previously controlled the character when it was last killed resumes control of a resurrected character. If other Evil servants are summoned (using cards in the usual way), they appear on the Hellmouth with only 1 health point. A new Artifact card is only introduced into the game at sunrise. When sunrise hits, place the first Artifact card in the Artifact space in the Museum. For each subsequent sunrise, place an Artifact card in the next Artifact space, in counter-clockwise order. No new Artifacts are introduced at sunrise after an Artifact has been placed in the Initiative. Evil Set-Up: Place the Master, Spike, Mr. Trick and Vamp X on their START spaces. Willow has found a techno spell that Jenny Calendar left behind on her computer that permanently Uninvites vampires from ever entering indoor areas. All Spell cards can either be used as the card describes, or as one of the special Uninvitation Spells. A Good character can only cast an Uninvitation Spell in an indoor area she or he is currently in, and the spell is only cast if at least 2 successful Majik dice are rolled. If a vampire is in the indoor area when an Uninvitation Spell is cast, the character instantly moves to the nearest possible space not affected by the spell. In the case of more than one choice of nearest spaces, the player controlling the vampire decides where to move. If it is sunrise and the nearest space is outdoors, the vampire moves to the nearest indoor location not affected by the spell, without sustaining any sunlight damage. If it is sunrise and there are no areas a displaced vampire can move to, that vampire dies. Whenever an Uninvitation Spell has been successfully cast, the affected indoor area is signified by placing a coin or some other marker inside the Uninvited area. Vampires can only sustain damage from sunlight or by being dusted with stakes (not from normal attacks). Even if a vampire holds a You Are Invited card, he/she cannot enter any indoor area where an Uninvitation Spell has been cast (although a vampire holding a You Are Invited card may still enter a blue indoor zone, unless that blue zone has been superceded by a special Uninvitation Spell. 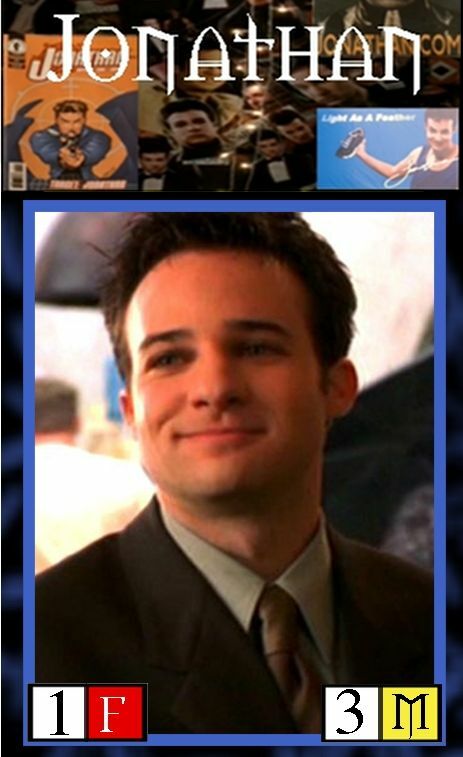 "The Vampire Buffy, the Vampire Slayer"
Evil Set-Up: Place the Mayor, Mr. Trick, Vamp X and Bad Faith on their START spaces. Good Objective: Destroy the Mayor. Buffy, Willow and Xander are vampires with their souls restored (so they are Good) for the entire game. Due to his werewolf blood, Oz cannot become a vampire. Evil Set-Up: Place the Master, Spike, Drusilla and Darla on their START spaces. Artifacts: Use the Mark of the Anointed, the Gem of Amarra, and two other non-story Artifact cards. The Master has developed a deadly virus that he hopes will destroy Buffy once and for all. Before the game begins, Evil rolls a blue movement die to determine which of the Master's evil servants will "volunteer" to become infected with the virus first. If a 1 or 4 is rolled, Spike has the virus. If a 2 or 5 is rolled, Drusilla has the virus. If a 3 or 6 is rolled, Darla has the virus. Whenever an infected player attacks another player and inflicts at least one point of damage in the attack, the defending player becomes infected with the virus, too. All infected Evil players lose one health point every time a moon with a 1 in it is rolled during any player's blue movement dice roll. All infected Good players lose one health point every time a moon with a 6 in it is rolled during any player's blue movement dice roll. If a Good player holds the Gem of Amarra Artifact, then that character is immune from the virus. If an Evil player holds the Gem of Amarra Artifact, it can only be used for its original purpose of protecting a vampire from sunlight. "The Evil Trio" and "Identity Issues" by Matthew Schutt and Chloe Reynolds. "Kaboom!" "Snake Eyes" and "Uninvited" by Matthew Schutt and Laurence Sutton. Original playing pieces designed by David Robertson. They look awesome!! On a personal note, we'd like to thank the creators of the Buffy board game who unknowingly saved us from going completely insane as a healthy diversion during the many months of hellish post-production on the Wayside Entertainment independent film While Supplies Last.